This blog will express my opinions on Lenny, Adam’s guide dog because that is all I can do. I can speculate on Adam’s feelings but this blog is going to reflect my take on the relationship that I see developing between Adam and his dog. I also have an effect on the relationship but I try to minimize myself as much as I can but for me it’s sort of hard to do because I love them both so very much. In my blog about Mitch, I credit him for Adam’s change of heart with the attitude about him getting his own guide dog. My approach to animals and Adam’s approach are two different things. I am much more a feelly touchy sort of person where Adam can be affectionate but he can also be a lot more detached. I am the one who is on the ground loving the big slobbery licks that dogs give so freely. Adam is just not that sort of person. He doesn’t like being licked by anything or anyone. Adam’s decision to get a guide dog was not taken lightly. He isn’t the sort of fellow who does things by the seat of his pants for the most part. He likes order much more than I do. 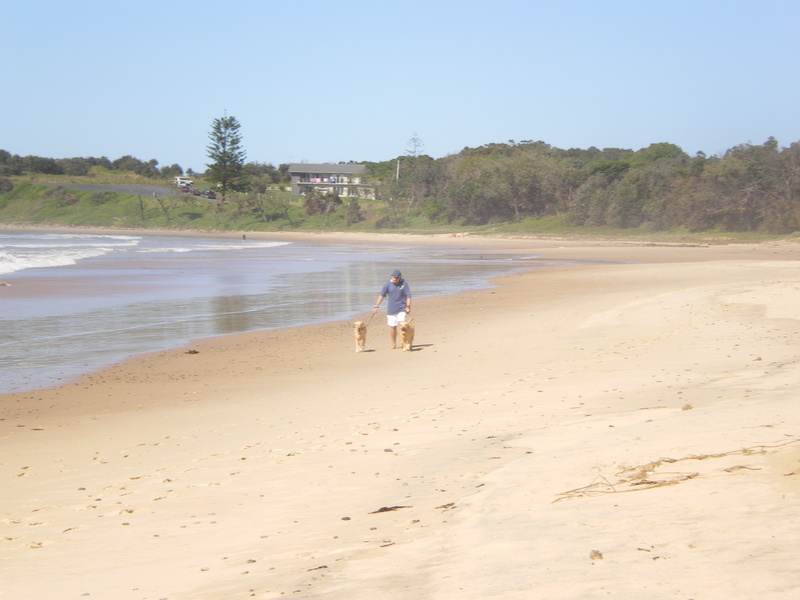 He contacted Guide Dogs NSW in 2007. He was assessed. I got to observe the whole process when the Guide Dog Trainer came out. It was quite funny seeing Adam interacting with the trainer taking him for a walk with a dog harness up to Werrington station pretending to be a dog (the trainer) while Adam was the handler. The trainer told Adam that they would be in contact once they found a suitable dog for him. Later on I think it was in July, Adam was contacted that a dog was found for him. The dog then ended up injurying itself before they were matched so Adam was back on the waiting list. In October or September we drove out to Glossodia for the Guide Dog Open Day, it was then that we got a glimpse at a dog that they hoped would be matched with Adam. 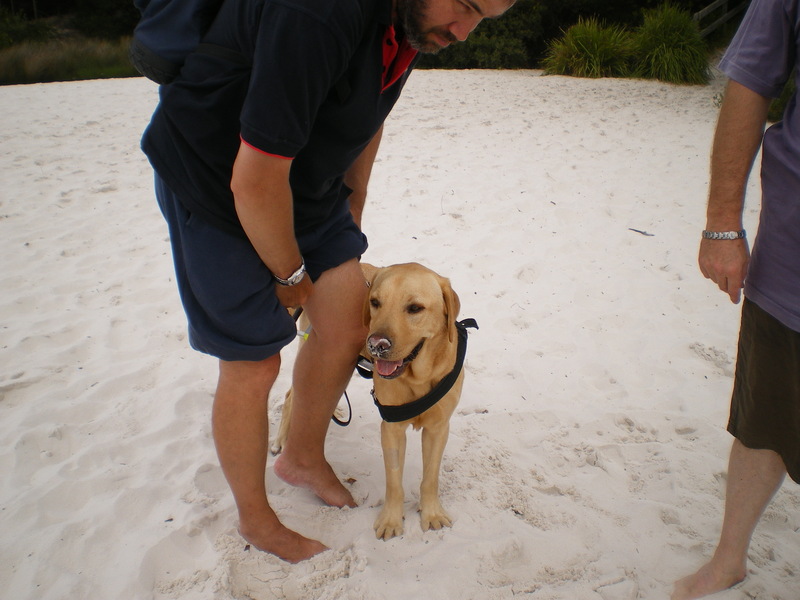 In November, Adam went to Richmond to train with Rinni, the guide dog chosen for him. They were together for training in Richmond for 3 weeks. I drove to visit because Richmond wasn’t that far from Werrington where we lived. I was told not to give too much eye contact or attention to Rinni. After the 3 weeks intense training that the pair received, they came to our house. For another 3 weeks, Adam and Rinni did training to get to work and other places that Adam needed to get to. I observed what happened. Adam was getting up ridiculously early to try to toilet Rinni so that they would get to his work on time. Rinni was a stubborn dog. He could also be mean to Mitch. We were not allowed to let the two dogs interact alone in case Rinni got hurt during free runs. I wasn’t sure why they thought Rinni would get hurt when Rinni was the one holding down Mitch making him cry during the free runs.The day Rinni was to graduate and become Adam’s guide dog, Rinni was his stubborn self, he pooed in harness in the middle of Central Station not indicating that he need to go after Adam had tried leash relieving him for half an hour before they went into the station. At this point, Adam was very frustrated. He expressed his frustration to the trainer. He thought that having a guide dog was supposed to offer a sense of freedom not chain him down in unrealistic tolieting behaviors that made him have to get up two hours earlier just to try to get the dog to poo in hopes that Adam could make it to the train station or work without the dog doing it in harness. Adam told the trainer it was unacceptable and he’d rather not have a guide dog if that was the case for him. He was better off with the cane. Guide dogs reassured Adam they would make it right so Christmas 2007 it was just Adam, me, and Mitch. Fast forward to July 2008, Adam and I just returned from our trip to Vanuatu. There was another guide dog that was trained especially for Adam by one of the trainers who had witnessed all the work Adam had done with Rinni. Adam and I both were skeptical about this dog but the man who trained Leonard tailored him for Adam. When we met Leonard, We knew it might work because within 5 minutes of introducing Lenny to Mitch, the trainer left the two to play in the backyard while he returned to his car to get more things. Lenny is such a joy compared to Rinni. He is very eager to please. He loves working with Adam. Adam can even touch Lenny while leash relieving him to try to figure out which thing Lenny is doing. If Adam tried to do that with Rinni, Rinni would refuse to go about what he was doing. Lenny is excited when he sees Adam go to the hall stand to get the lead as well as the harness. He even tries to help put the harness on himself. One of the nicest things with Lenny was that they trained at home. I got to go with them every time they went out to train. I would observe the lessons absorbing as much as I could to try to aid Lenny and Adam’s partnership. The trainers were forever telling Adam to praise Lenny vocally. It was wonderful watching the two of them bond as well as Mitch and Lenny bond. I have to tell myself not to make too much eye contact with Lenny or love on him too much because I don’t want to interfere with their working relationship. I often wonder if I have infected my love into Lenny. I see how Lenny reacts when he sees me coming towards them when I am picking them up some place or meeting up with them in town. It’s a real chore for Adam to get Lenny back on task if I have shown up or he has to leave me. I will not pet Lenny while in harness for the most part. I admit when no one is looking, I have slipped which I mustn’t do but it’s only when he’s in the boot of the jeep or we are at home. It wasn’t long after Adam and Lenny bonded we discovered that Lenny had irritable bowel syndrome. He just could not put on weight. Guide Dogs helped Adam with the medication that Lenny needs. He has to eat special food which all of our dogs eat. We thought he might have to be retired but it was not the case. Lenny is medicated for life but he is an eager helper for Adam always full of love and ready to go for walks whether it be in harness or out of harness. In this picture, you can’t tell that Adam is blind. He just looks like a man walking two labs down Mullaway beach. Mitch is on the right and Lenny on the left. Guide dogs always are on the left. Lenny is dog distracted when working at times. It stems back to when he was attacked by a stray dog. Adam says he has “Bush Syndrome”. He has to get in first before the other dog tries to attack. Guide dogs has worked with them but it’s still not quite resolved. Lenny has had clicker training. One guide dog instructor was about to teach the method to Adam but she had to go down to Sydney to help with training other dogs because NSW is short on instructors. Maybe one day, it will all be worked out. I am really glad that Adam made the decision to get a guide dog. I love Lenny but know he’s Adam’s dog. I will play with him but think of him strictly as Adam’s dog. I do shower him with affection but try to encourage him to seek Adam out. Mitch and Grady gets heaps of loving from me. I feel sort of bad for Lenny when he comes up wanting me to love on him too. I do a little bit but not to the extent that I do with the other two. It’s wonderful watching Grady and Mitch get excited when they see them coming down the road and up the deck to the front door. They are a happy pack. I am really blessed to see the bond develop between Mitch, Lenny, Grady, Adam, and myself. Mitch is our dog, Lenny is Adam’s dog, and Grady is my dog. I like to think of Lenny being partly owned by me but that’s not really realistic. He is part of my family unit though. Adam only tolerates Grady because I wanted him. Mitch though, is our dog together. Lenny is definitely Adam’s guide dog. He helps my man go places. It’s a privilege to watch them grow in their working relationship. I am glad to be a part of this wonderful relationship. I am happy to teach them new places. I get a real sense of accomplishment when I do something like that. If I can help those two work together without getting Guide Dogs in, I think I have helped. We do call Guide Dogs if I am not sure of a route but for the most part, I can do just as well as a guide dog instructor. Adam is a great cane user. His independence is remarkable. His speed with Lenny is awesome. I practically feel like I am jogging to keep up when they know where they are going or I have to catch up with them. Lenny’s trainers did great work for Adam. They really selected a wonderful dog who helps Adam with his mobility. It just goes to show, you can’t keep a good man or dog down for long! Thanks for stopping by and reading! Have a great day!